I always thought that they stopped releasing songs that had a more classic feel to them around "Vulture Street", but listening to this album again find that this album is joining that group for me and many of the songs are aging very well. I guess time will tell if "Golden Rule" can join that. A solid album. Not up with their greatest but keeps in with their sound quite nicely and fits into their catalogue well. An interesting mixture of wellknown singles like 'Lost And Running' and 'I Don't Remember' and obscure gems like 'Black Tears'. Great stuff. 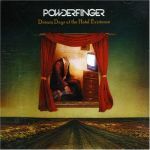 This is actually quite an enjoyable listen, which I'm surprised at because I never paid much attention to Powderfinger besides the singles. Bernard Fanning has a very nice voice (I hated his solo venture and therefore never took the time to actually listen to how good his vocal is) and carries the music well. There are a couple of 'dull' tracks for me, but there are no really bad ones, making this a really pleasant album all up. 4.6/6.